One of my goals for 2016 is to discover 10 new authors this year. To this end, I began a series called The Hunt by Andrew Fukuda. This book isn’t just fascinating because of its bleak dystopian civilization or the young main character who is forced to pretend he is a blood-craving, light-fearing, emotionless member of the night-dwelling society that populates the planet (not the human he is). 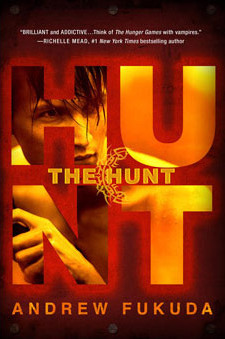 His character progression is the most riveting aspect of this story, as we watch him go from the self-loathing outsider in society to discovering that other humans are still alive–and that he will soon be forced to hunt them to maintain his secret, because if anyone finds out he’s human, he will be instantly devoured. Eventually he must begin to see himself as the same as these humans, although they are not like anyone he’s ever known. Watching his growth is a fascinating experience that has reminded me what makes a great book. Because stories are ultimately about characters who are forced to grow and change, no matter how big the challenge. I just started the third book in the series, and I am devouring these like…well, like a blood-hungry dusker. What book have you read lately with a really gripping character journey? This entry was posted in Books and tagged 2016 goals, amreading, Andrew Fukuda, audiobook, Author, character journey, duskers, dystopian, ebook, paranormal, progression, reading, series, suspense, The Hunt, vampires, writer, writing, YA, young adult. Bookmark the permalink.